Re-enforce the topics covered in the morning on beaver ecology and complex ecosystem and hydrogeomorphic feedbacks. 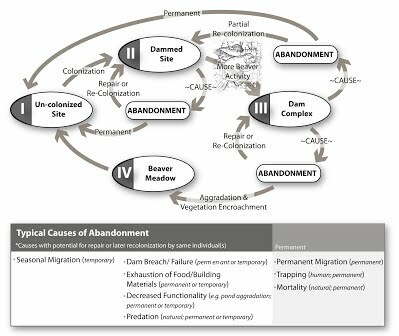 As we make our way through the watershed, we will point out different examples of each stage of these cycles. We will visit sites in Right Hand Fork, the mainstem Logan River, Franklin Basin and spend most of the afternoon in Beaver Creek. We're spending this time in the field to both reenforce the concepts of beaver ecology and ecosystem feedbacks from the morning as well as to give you an up-close appreciation of how these systems function. We will have a few brief lectures, but most of the afternoon will be discussion and time for you to explore on your own and reflect on what you're learning. We will walk a couple mile stretch of beaver creek asking you to classify the dams and sites you encounter. All of the instructors will be on hand to chat with you individually as we make our way down the creek. In the field, we will begin to teach you how to identify, measure and make rapid estimates of each. You fill out one form for each dam. A form can be filled out in 1-5 minutes. Naiman RJ, Johnston CA and Kelley JC. 1988. 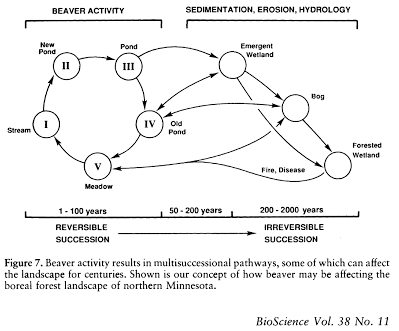 Alteration of North-American Streams by Beaver. Bioscience. 38(11): 753-762.